For decades, fast-food giant Burger King has been the undisputed Home of the Whopper — the chain’s signature sandwich featuring one of its flame-grilled, “no nonsense” 100 percent beef patties. So, what happens when the Whopper doesn’t actually have any meat? Made up of mostly soy and potato protein, and featuring coconut oil, sunflower oil and heme — an iron-rich protein that simulates the texture, color and taste of actual meat. For years, Burger King has offered a veggie burger on the menu at its thousands of restaurants, but it was not marketed as anything even remotely resembling a juicy, tender slab of meat. So far, the Impossible Whopper is only available at several dozen restaurants in the Midwestern city of St Louis. But Burger King’s chief marketing officer Fernando Machado told The New York Times that the company expects to quickly expand availability nationwide if all goes well. “I have high expectations that it’s going to be big business, not just a niche product,” Machado told the paper. 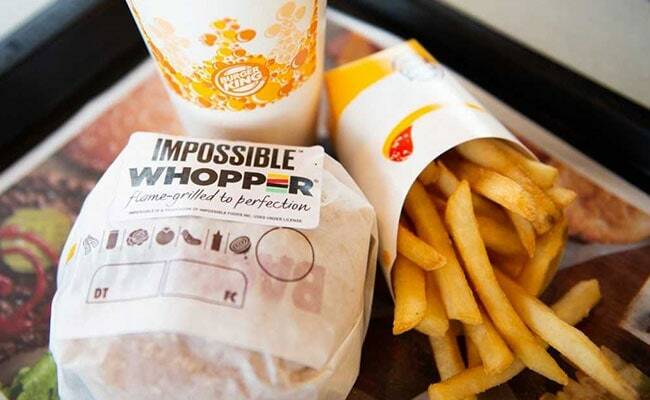 Burger King’s tie-up with start-up Impossible Foods is the latest, perhaps boldest move by a power player in an industry seeking to make inroads with customers on plant-based diets. On Tuesday, Nestle announced plans to roll out “cook from raw” plant-based burgers in Europe — under the Garden Gourmet brand — and in the United States under the Sweet Earth label. In December, Nestle competitor Unilever said it had bought up Dutch brand De Vegetarische Slager (The Vegetarian Butcher) to position itself in the expanding sector. Impossible Burgers are already on the menu at US chain restaurants White Castle and, as of Monday, Red Robin. The Silicon Valley company, founded in 2011, is planning to launch its products in supermarkets later this year. While soy burgers have existed for quite some time, several companies have taken the product up a notch by using sophisticated technology to make it taste, look and smell like meat. Beyond Impossible Foods, other start-ups in the United States like Memphis Meats and Just, or Mosa Meats in the Netherlands, are working to develop meat from animal cells, not actual animals. Nestle’s new products are made from soy and wheat proteins, with plant extracts such as beetroot, carrot and bell pepper. “They even make the sizzling sound of a regular beef burger during cooking,” it says. “We believe this trend is here to stay,” it says of plant-based food. Indeed, a survey carried out by Nielsen for the Good Food Institute and published in September last year showed that sales of plant-based foods grew 17 percent over the previous 12 months. A vegan diet has major health benefits, reducing risks of diabetes and heart problems, but some health professionals say that vegans run the risk of not consuming enough of certain nutrients like protein and iron.